Filing an Insurance Claim for Hail Damage to Your Restaurant | The Voss Law Firm, P.C. Texas businesses suffer many destructive hail storms, and every one is a threat to both the physical structure and the future of the enterprise. Each year, business owners examine their roofs and their coverage carefully, and only a select few will be able to fully recover from a major loss. 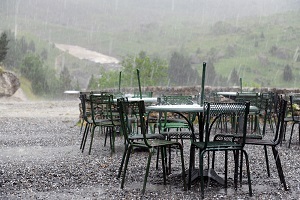 Attorney Bill Voss takes a look at the most common reasons restaurant property damage claims are denied after a hail storm, and offers tips to remember as you file for coverage. It is unfortunately common for insurance companies to deny property damage claims. However, a claim denial must carry a legitimate reasoning behind the decision. If your claim is denied, you should examine the policy carefully and note the specific terms and exclusions outlined in the policy. If you disagree with the decision, you may need an attorney’s help to reassert your claim. Extent of coverage. It’s much cheaper for the insurance company to replace a few shingles or damaged flashing than replacing a whole roof after a hail storm. Others may agree to fix the damage to your structure, but refuse to pay for damage to your company vehicles or the landscape surrounding the property. Reason for coverage. Insurers may argue over what exactly caused the loss to your property. For example, a window shattered by golf-ball–sized hail may be covered, but the damage to the wooden floor from the incoming rain may not. Mitigation of damage. Insurance policies do not just list when and how a loss will be covered, they also outline all of the duties a policyholder must perform after a loss occurs. If you fail to file the correct paperwork, meet deadlines, or take steps to prevent further damage, your insurer may be able to pay less on the claim. Additional coverage. The structure is only one element involved in bringing your restaurant back to life. If your insurer denied full payment for your business interruption coverage, you may have to lay off members of staff or reduce your employee’s wages, severely impacting your ability to serve customers at capacity. If your claim has been denied or undervalued, it is important to remember that you have options available to you. The Voss Law Firm proudly represents policyholders who were denied fair payment for their losses despite paying high premiums year after year. Simply fill out the contact form on this page today or order a free copy of our book, Commercial Property Owners Must Read This BEFORE Filing an Insurance Claim.